I took a day off work today to have a double lesson of circuits, I took the day off as the parachute club doesn’t normally operate on a Monday, thus allowing me to get more circuits in, so making best use of my time and money. The first hour went OK, some good landings, some not so good, but I was gradually improving over the duration of the lesson. The hour was soon up and we returned to the clubhouse for lunch; Katie took a new guy up for a trail lesson and I took some pictures of Hazel doing circuits in her Thruster. Lunch was soon over and Katie was back from giving the trial lesson and it was time for Mike and I to continue my lesson. After a couple of circuits on the climb out Mike shut the throttle and I immediately got the nose down and selected a nice black field to land in. I was pleased I reacted to the simulated engine failure, but Mike did point out my selection of landing site was not the best and to always aim for a field with a crop in where possible as a newly ploughed fields will stop the aeroplane quick and possible flip it over. Full power on and turning climb back up to circuit height. The landing was quite good for me, especially as it was yet another windy day! On the next circuit we had another simulated engine failure just as I turned on to downwind leg. Again I got the noes down and turned into wind and this time selected a green field! We climbed back up to circuit height and again my landing was not bad for me! On the next circuit Mike had another test for me, this time just before we turned on to base leg Mike said “right there’s an aeroplane on the runway about to take off, what should we do?” I said and apparently it was correct that we should extent the downwind leg to give them time to take off and that’s what we did. On turning on to final I kept the power on until we were nearer the runway and flew yet another OK approach and landing, apparently Mike wanted to check I would keep the power on as needed and I had passed this test too. We taxied back to the club house and I felt quite pleased with my efforts, but the day was not over! 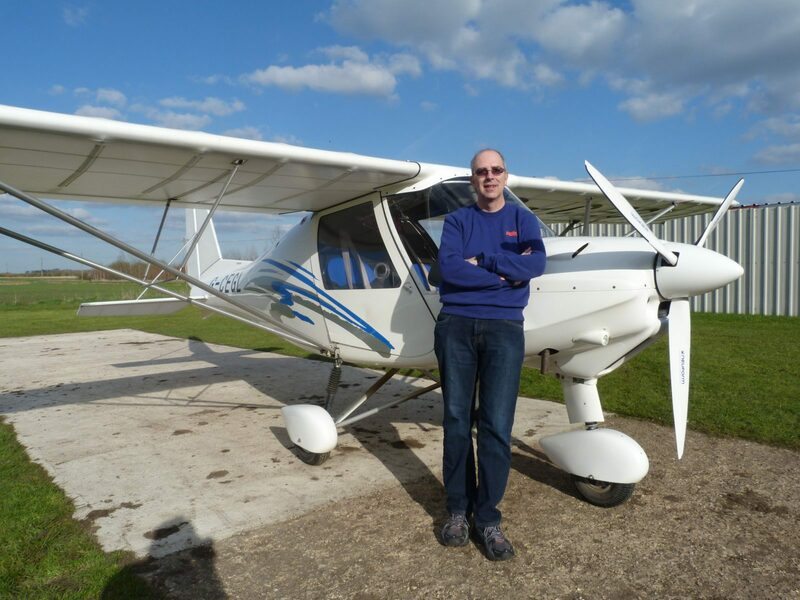 Once back Mike asked if I wanted to do my maiden solo flight and I nervously agreed, well I think it was nerves, in hindsight I think it was a mix of many emotions ranging from excitement to trepidation as I filled with both self-confidence and self-doubt. Mike gave me a chat to re assure me and reminded me to go around if needed. 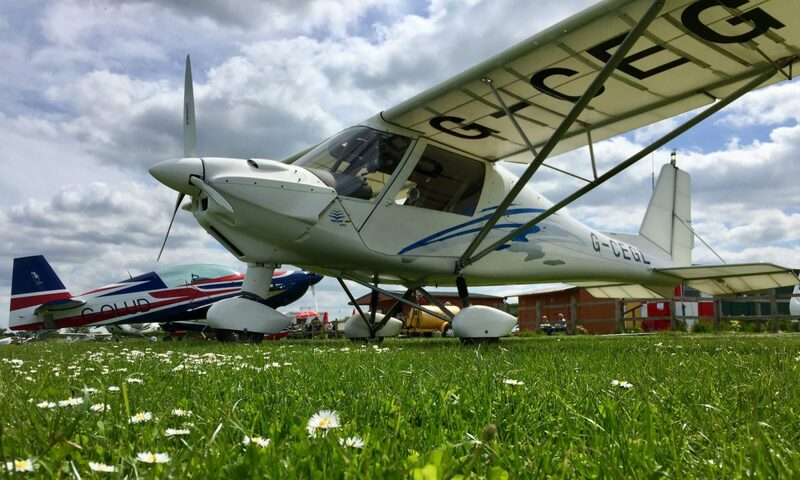 Mike left the aeroplane and I commenced the start-up checks, I radioed my intent to taxi to runway 19 and commenced taxiing, I back tracked 19 and lined up for take-off and it somehow felt normal and all my nerves had gone. Another radio call stating taking off on 19 and away I went. 500ft fuel pump off (no flaps were needed for the take-off), the climb out was a lot quicker, as Mike said it would be and I found myself going straight through the 700ft circuit height, so I reduced the power and descended back to circuit height and turned onto crosswind, all seemed to be going to plan now. I saw my turning point and turned onto downwind, I carried out my checks, switched the fuel pump on and made my downwind call. I turned onto base leg at circuit height and checked the runway and approach were both clear, as I came up to my turning point onto final I took the power off and put a stage of flap on and turned on to final, I then added a second stage of flap and saw I was going to be short, so I put some power on and continued. I won’t lie my landing was not the best of the day, but it was OK and I was down without breaking the aeroplane or killing myself! Like a mad man I had been talking to myself all the way around just as I do when Mike is actually sitting beside me, I guess its force of habit! Back in the clubhouse I was surprised that it had taken 15 minutes, it seemed no longer then 2 or 3 to me. Everyone congratulated me and Pete added that I had done well especially given the wind conditions. I felt totally shattered and immensely satisfied of my achievement and indebted to Mike for his tuition and support from Katie and the other club members. So a major milestone achieved, but I still have a long way to go. Brilliant achievement – well done Adrian! Next PostNext Finding my way in navigation!